The outdoor Marina Theatre opened in 1937. It seated up to 4,000 people. Does anyone know if Ronnie Mills and his orchestra/ band or Neville Bishop and his Wolves used to play to full houses? 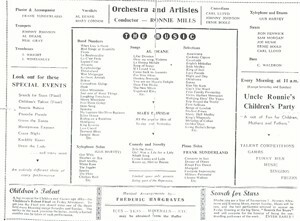 The programme illustrated here not only names a lot of the performers and promoters involved but also - through the adverts - gives an idea of some of the other events happening in the town in 1951. By the 1970s the best days of seaside entertainment were past and The Marina was pulled down, to be replaced in 1981 by the Marina Leisure Centre. This page was added by Paul Douch on 21/03/2007. My father actually printed the programme shown and says that the Marina was regularly packed especially in the evenings. My mum was a keen fan of Neville Bishop and went to see him very often. I was a very young actor at The Little Theatre at the time and clearly remember Neville Bishop and his Wolves playing to packed houses. He would invite people up on the stage to do their 'turn' A rather eccentric lady known as 'Miss Lilly' seemed to be a regular and there was something very sad about her. I remember that Neville was always gentle and didn't send her up. They were happy time and the town had some style then. Where did it all go to? By the way, I'm still acting - but older now! I remember Neville Bishop in the fifties (and I think very early 60's) but can't recall Ronnie Mills. Bishop's orchestra often played in the afternoon, as well as almost every evening. Their party piece was a version of "MacNamara' Band" which they did in style, marching around the audience playing their trombones amid much laughter and untold enjoyment. In the post war period people were simply happy to be alive and wholesome entertainment like this was very welcome. 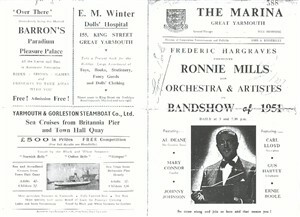 I knew Ronnie Mills, he worked at Clacton on Sea and then went to Valley Farm Caravan Park (Holland on Sea). He was the residential compare there for many years, ran the Bingo and all actitivies. (A very Nice man). Ronnie is shown on film archive (briefly) for the Clacton on Sea Historical Society and on a cine film which which I took of him at Valley Farm and today I have just had returned from being transferred to DVD. I believe he died about five years ago. I was informed Ronnie Mills died about 5 years ago. This information was incorrect. In todays Frinton & Walton Gazette, page 24 is his obituary. He passed away earlier this week aged 92. I apologise for passing on wrong information which was obtained from someone else who knew him. I have moving pictures of him working at Valley Farm. They are only short clips transferred from cine film to DVD and hopefully I can transfer them on to a DVD. If would like these for your archives I will copy them for you (when I get used to new software). Thanks for updating us about Romnie Mills. Sorry to hear that he has passed away. Yes we would be interested in receiving a DVD copy of the film if you would like to send it to me at Time & Tide Museum, Blackfriars Road, Great Yarmouth, NR30 3BX. 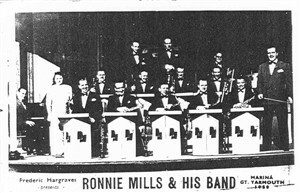 I can't remember Ronnie Mills but Harry Hudson and his band were there during he summer season of 1954. I have a photo of me with him (I entered a personality contest).